Set up your first drift with a short forward cast that puts your fly just over the shoreward edge of the longshore bar, with your line 45 to 60 degrees offset to the flow of the rip. IT IS FIRST LIGHT when you hit the beach — a thin rain drizzling through thick overcast. Third hour of the flood. Tide rising at its fastest rate. Surf bores two to three feet high stream in ragged lines toward the beach foreslope. The swash zone right at your feet is a caldron of turbulence. The sky teems with shorebirds of all sizes, tracking and diving into a profusion of mini-baitballs evenly distributed across and the surf zone. The signs bode well for major stripers within easy casting range from where you are standing. Under these surf zone conditions, it is biologically stupid for stripers to burn up energy running down clusters of prey scattered across the beach’s nearshore zone. Instead, they set up ambush lies at “choke points” along the seaward return path of surf backflow from the foreslope — letting the beach’s “circulatory system” collect, concentrate, and convey prey to them. The most dynamic of these choke points are trough entrances into foreslope scour holes. At any of them, the closer a striper can maintain herself to the trough’s mouth, the better shot she has of intercepting concentrated streams of prey conveyed in the trough. 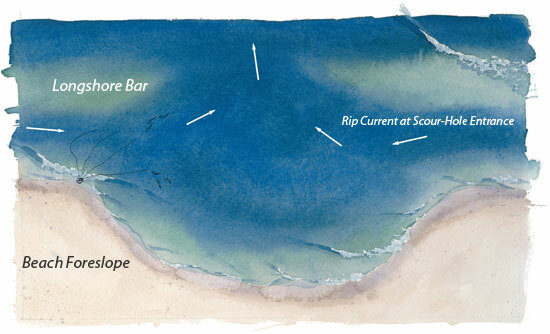 Given the present intensity of the turbulence in the swash zone, the odds are good that stripers staked out at trough entrances are the strongest and most massive foraging this stretch of beach. Set up your first drift with a short forward cast that puts your fly just over the shoreward edge of the longshore bar, with your line 45 to 60 degrees offset to the flow of the rip. A 35- to 45-foot cast probably will suffice. Anticipate a hit as soon as your fly lands. Make three or four presentations progressively longer in length and duration from the same location before moving on. Go with your short game first at any of them. And anticipate that your fly will be hit as soon as it touches down in the surface film — anticipating her hit will help turn on your nervous system, and reduce your head’s start-up inertia when it happens. Set up your first drift with the shortest forward cast that puts your fly just over the shoreward edge of the longshore bar, with your line at an angle 45 to 60 degrees offset to the rip’s flow. Apply a quick pullback mend just after you see your leader touch down ending with your rod tip “lagged” behind the alignment of your line head and fly. This move gets your fly down in the water column and sweeping across current almost immediately. Don’t attempt any additional adjustments to your fly’s drift — just let sweep across the rip into the edge of the seam projecting along the foreslope. Maintain just enough pressure in your line to feel the tension of the current against the swing of your fly. If your fly gets bumped, immediately feed line to get it in a downcurrent dead drift, simulating a stunned prey. Stripers near your fly as it gets whacked should respond to this ruse as an easy feeding opportunity. When your line straightens, let your fly breath for a five count in the eddies shoreward of the seam before you lift into your next somewhat longer presentation drift.